"Ann dreams of a marriage proposal from her poetic suitor, Eli - until Will Hanby shows her that nobility is more than fine words. On a small farm in 19th-century Ohio, young Ann Miller is pursued by the gallant Eli Bowen, son of a prominent family. Eli is the suitor of Ann's dreams. Like her, he enjoys poetry and beautiful things and soon, he will move to the city to become a doctor. Ann travels to Pittsburgh, accompanying her father on business. There she meets Will Hanby, a saddle-maker's apprentice. Will has spent years eking out an existence under a cruel master and his spirit is nearly broken. But Ann's compassion lights a long-dark part of his soul. Through his encounters with Ann's father, a master saddler, Will discovers new hope and courage in the midst of tremendous adversity. When the Millers must return to Ohio and their ministry there, Will resolves to find them, at any cost. If Will can make it back to Ann, will she be waiting?" Read an excerpt here: http://www.rosslynelliott.com/books.php. "Rosslyn Elliott grew up in a military family and relocated so often that she attended nine schools before her high school graduation. With the help of excellent teachers, she qualified to attend Yale University, where she earned a BA in English and Theater. She worked in business and as a schoolteacher before returning to study at Emory University, where she earned a Ph.D. in English in 2006. 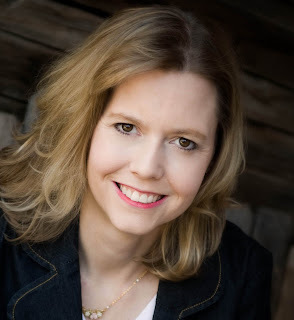 Her study of American literature and history inspired her to pursue her lifelong dream of writing fiction. She lives in the Southwest, where she homeschools her daughter and teaches in children's ministry." For more about Rosslyn, visit her website: http://rosslynelliott.com. To celebrate the release of her debut novel, Fairer Than Morning Rosslyn Elliott is giving away two fabulous prize packages. The first is brand new KINDLE in her Fairer Than Morning Kindle Giveaway. Then on September 20th she's giving away a $200 gift certificate toward a Custom-Made Historical Reproduction Dress (from Recollections) during the Fairer Than Morning Book Club Chat Party on Facebook! Sigh...romantic. 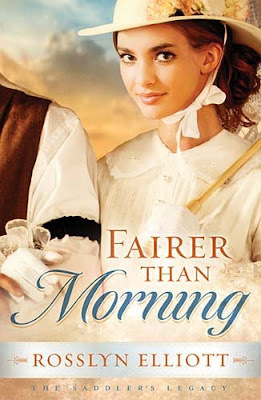 Fairer Than Morning is receiving wonderful reviews - Library Journal said, "A well-written historical series debut…". Read more reviews here. Be sure to join the fun and enter the Kindle contest! To enter just click one of the icons below. But, hurry, giveaway ends on 9/19. Winner will be announced on 9/20 at Rosslyn's Book Club Facebook Party. Details and official rules can be found when entering the contest. Then be sure to RSVP for Rosslyn's Facebook Party! During the party Rosslyn will be chatting with guests, hosting a book chat about Fairer Than Morning (don't worry if you haven't read the book yet - you could win a copy! ), historical Fiction, and testing your trivia skills. She'll also be giving away that $200 gift certificate toward a FABULOUS custom-made period dress from Recollections! Fairer than Morning is a book for romantics. The plot will hook you in from the first page, and you will delight in watching Ann fall in love. But the story isn't all about Ann and her romance...it's also about Will's journey as an apprentice, how he comes to meet Ann in the first place and how he finds her in the end. The mysteries surrounding the characters will intrigue you, and you will come to love each and every one of them by the end. The best part is that this book is actually based on a true story! If you love mystery and romance, then this book is for you! I am sure you will enjoy it just as much as I did. Cost: You can buy Fairer than Morning for $10.92 from Amazon.com. Overall: We give Fairer than Morning a 10/10! We were sent "Fairer Than Morning" through LitFuse blog tours free of charge for the sole purpose of this review; no other compensation was received. All opinions expressed are my own.